The previous two pages included advice on all types of lighting for cyclists. In addition to lights, safety equipment for cyclists includes a helmet and a rear-view mirror is helpful in certain situations. The bike itself should also be checked to see if it’s safe. In countries and regions in which laws have been introduced to make helmet use mandatory for adult cyclists, the number of people who cycle often decreases, thereby reducing the overall health of the population. Most countries in the world leave the decision of whether to wear a helmet while cycling up to the individuals, which is the sensible thing to do if the government’s goal is to increase the overall health of the population. Despite very few countries having helmet laws, almost all cycling races require helmets to be worn by all participants. A major reason for this is so that race organizers can show that they’ve done everything reasonable to ensure rider safety and so reduce their liability. Bicycle helmets are designed to absorb impacts from typical falls to the ground as simulated in laboratory conditions (see this article). There is research suggesting that helmets also do a reasonable job at reducing the extremity of injuries even in high-speed collisions with motor vehicles (see this review article). Using a helmet is therefore advisable. Helmet standards vary slightly between countries, but most helmets offer a similar level of protection regardless of their price or other features. The primary differences between models are therefore fit, degree of ventilation, weight, and styling. 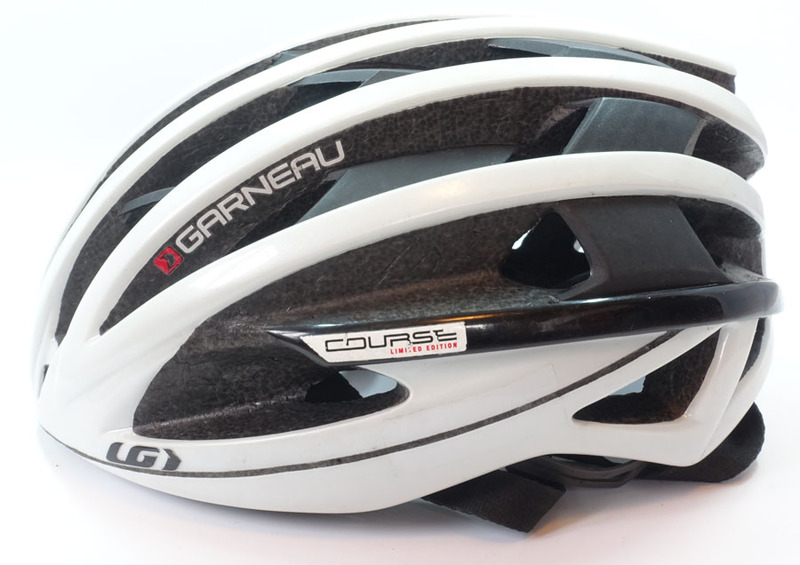 Recently, many brands have released road helmets that are slightly more aerodynamic, some of which do make a marginal difference even when cycling at slower, ultra-distance cycling speeds (see the page on Air Resistance of the Cyclist). I have a mirror on my long-distance bike and although I don’t use it very much, I still wouldn’t want to remove it. Most people think that having a rear-view mirror on their bike is dorky and un-cool. I don’t care about that because they can be extremely useful in certain situations and might save my life. Dying is pretty un-cool. Using a mirror may slightly reduce the chance of having a crash of Types 1a and 1b (according to the list on the Causes of Bike Crashes page) in certain situations. There are specific circumstances in which a rear-view mirror is very useful. One such situation is when riding on a road that is not quite wide enough for the volume of traffic that uses it. In certain situations, when I notice that a large vehicle is approaching from the front then I check my mirror to see if there is another approaching from behind. If there isn’t enough space for the two vehicles to pass each other and me at the same time and the vehicle from behind is not slowing down, then I have occasionally steered off of the road at the last second to let the vehicles pass safely instead of trusting that the drivers won’t put me in danger. Another situation is when the road surface is very poor, particularly towards the edge where I would normally ride. If the surface quality is so bad that I want to ride more towards the center of the lane then I will regularly check my rear-view mirror to know when a car is approaching from behind and I’ll then move onto the rougher edge of the road until the vehicle passes. In these situations, it would also be possible to look over my shoulder to check for vehicles. However, despite being a skilled cyclist, I know that turning my head will have a slight effect on my steering. There is always a chance that a car is about to pass dangerously closely while I turn my head, especially if there is enough traffic around that I won’t hear every approaching car, so steering away from my line even slightly while checking over my shoulder could result in a collision. If I can instead take a quick glance at my mirror without turning my head then I feel much safer. Just like there are many bicycle lights that are extremely poor quality and are not suitable for the job, there are also many rear-view mirrors that are poorly designed. Jesse discusses a few options in the video above and I’m personally reasonably happy with the Sprintech model that is shown above that fits in the end of my handlebars (Amazon). Other people prefer mirrors that clip onto their helmet or glasses. Is your bike likely to injure you in a crash? Despite the fears of some professional road racers, being injured by a disc brake rotor during a crash is an extremely rare and unlikely occurrence, so I don’t consider that to be a problem, but there are other parts of your bike that you should be concerned about. Chainrings cause far more injuries than disc brake rotors. Most experienced cyclists have been wounded by a chainring at some time in their lives. I personally know that chainrings can cause injuries and leave scars without a fall even occurring. I therefore have a guard mounted outside of my large chainring on my long-distance bike. It doesn’t look cool and it adds a small amount of weight, but I like the protection it offers and it also keeps chain oil off of my legs, which is useful when riding for multiple days without much opportunity to wash. 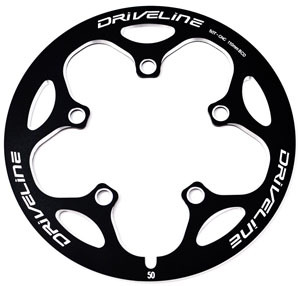 Unfortunately, chainring guards are not available for many modern cranksets with special chainring designs, so I choose my cranksets with this in mind (the brand Driveline sells many models of chainring guards on Amazon, including this one). Other parts of your bike that could injure you during a fall are things that protrude away from the bike, which normally means the handlebars and aerobars. Falling onto a bar with an open end can cause a serious injury, so many races have regulations that handlebar and aerobar ends must have bar-end plugs installed (see this report at road.cc about a fatal incident and the subsequent comments that mention several similar occurrences). Bar-end plugs are one of the items included in the safety check before the Transcontinental Race. After ensuring that your bike won’t injure you during a crash, you should ensure that it is in good working order so that the chance of having a crash of Type 3d (according to the list on the Causes of Bike Crashes page) is diminished. There is a complete page of this website devoted to Bike Maintenance. The steering components and brakes are the most important things in terms of safety. Ensure that your brake pads are not too worn down and on extra-long rides and tours it’s advisable to bring one or two spare pairs of brake pads with you and know how to change them on the side of the road if necessary. If something breaks on your bike then it may cause you to crash, especially if it is a part on the front half of the bike. You should therefore be extra cautious if there is any chance of your fork, stem, handlebars, or front wheel being damaged. Carbon handlebars are at least as strong as aluminum handlebars, but either can get damaged, even by the bike simply falling over by itself. 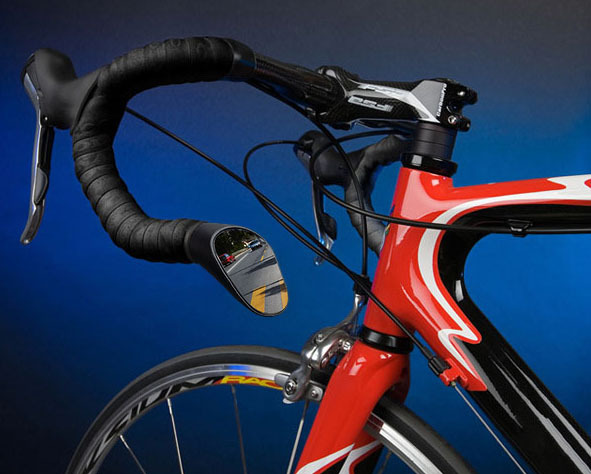 The safety advantage of using aluminum handlebars instead of carbon bars is that damage to aluminum bars is normally observable due to the bar being bent; in contrast, with carbon bars the damage may be hidden until the bar fails catastrophically. Some people therefore prefer to use aluminum handlebars for self-supported ultra-distance events. More advice about choosing strong and reliable components is contained in the Bike & Components section of this website. This page is in the Rider Safety section. Having covered all aspects of bike equipment related to safety, the following pages focus on how the rider’s behavior can affect safety, with Avoiding Bike Crashes the topic of the next page.